It's not very often that I've failed to put something up here about a good hillwalk before a possibly even better hillwalk took place, but that's the unpredictable Scottish climate for you. Glorious sunshine two weeks in a row'll never catch on up here. Anyway, it's been a busy week, so here's a summary of things that I'll almost certainly endeavour to try and write about in the not too distant future. Probably. 1. The Good Friday trip to Glen Shiel. 2. A fantastic Finisterre baselayer that some folk sent me to review. 3. Yesterday's excellent trip with Andy, Jim & Colin to Glen Affric. Photies here. 4. 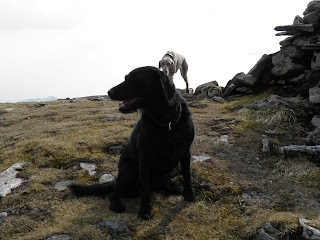 The fact that the Glen Affric jaunt saw the Wee Black Dug clock up her 50th Munro. Well done the Wee Black Dug!